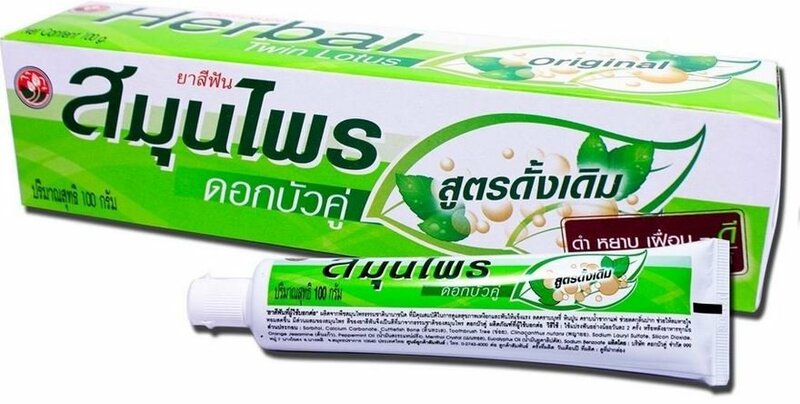 Twin Lotus Original 40g is a fluoride free Thailand Herbal Toothpaste with many natural herbs. It can provide you with a natural herbal solution to look after sensitive teeth, tooth decay, gingivitis and inflammatory bleeding gums. There are also positive whitening effects Experience a superior cleaning performance for your sensitive teeth and gums. So why not try out Twin Lotus Herbal made from many natural herbs. The teeth and gums are nourished naturally from herbs. It is a fluoride free flavoured toothpaste that is memorable and effectively cleans teeth and gums. For over thirty years, the oral care company Twin Lotus concentrated on the healing qualities of natural herbs. Instead of chemicals to provide a natural antibacterial action to prevent tooth decay and cavity causing bacteria. The many herbal Extracts are a unique way of combining some medicinal properties with therapeutic properties. Twin Lotus extract from the best plant parts until they are happy with the concentrated herbal extract. There is a unique herbal aroma, that is easy to use and this natural herbal toothpaste is non astringent. The toothpaste has an unusual dark colour because the natural herbal ingredients preserved and are not bleached white. It also has a slightly bitter taste because it does not contain any artificial colourings. There is a secret formula that consists of selected herbs to provides healthy gums the vital nutrients that are lacking in our diets. Clear away mouth ulcers and cure gingivitis at a low cost. When used continuously on a regular basis, gain a confident smile by reducing any accumulation of food stains, nicotine, coffee and tea. Herbal extracts can reduce the bad breath problems caused by Halitosis. Fluoride free Twin Lotus Original can reduce bad breath quite well. Especially from a strong smelling food like fish, onions or garlic. It is a great source of minerals and calcium.It can help with bleeding gums and blood clotting. Extracts from the tree called Streblus Asper known as the toothbrush tree have been established for thousands of years as a “natural toothbrush". Streblus Asper Leaf Extract helps strengthen teeth and gums. is is also known by the common names phaya yo in Thai language. It has many therapeutic uses such as for sensitive teeth with pain and inflammation. It has the positive effects on your teeth of being an antioxidant, anti-inflammatory, anti-analgesic, antibacterial and antiviral with no toxicological effects.It is even used to treat snake bites! Help to provide your breath will all day freshness. Peppermint oil has antiseptic properties to help your teeth. It can eliminate your bad breath and help your teeth and gums by fighting off hazardous germs and is a treatment of a toothache. Reduce plaque and tartar building up with regular brushing and having routine dental cleanings. Adults and children of two years of age or older should brush well after each meal or use at least two times a day. Only use a small amount of this herbal paste. For a child under two years, consult with your dentist before using.